Heart of Glass (1976) aka Herz aus Glas was the second Werner Herzog (Even Dwarfs Started Small, Stroszek) film I ever saw and I must admit it was a decidedly disappointing experience that caused me to feel reluctant in regard to watching any more films directed by the Bavarian auteur, but over a decade after my initial viewing of the film, I can certainly say my opinion has changed rather dramatically, even if the film is a fundamentally flawed work. Loosely based on a chapter from the novel The Hour of Death written by Bavarian Anarcho-mystic auteur Herbert Achternbusch (Das Gespenst aka The Ghost, Wohin? ), which was, in turn, based on an old Bavarian folk legend about a Nostradamus-like southern kraut prophet named Mühlhiasl (who may have been legendary Bavarian cow herder/seer Matthias Stormberger (1752-? )), who predicted the end of the world, Heart of Glass depicts the cultural chaos that occurs in a small town that thrives on ruby glass when the master glassblower dies and the mysterious secret to creating the glass is lost, thus sending its peasant populous into a sort of mass hypnosis of the somewhat homicidal yet also somewhat humorous sort. Utilizing what some might describe as a dubious gimmick, director Werner Herzog claims to have hypnotized virtually every actor (except the lead and some professional glassblowers), and directed them as such during the entire production of Heart of Glass, thus making for a strikingly strange celluloid work of the slightly oneiric, strangely ominous and atmospheric, and morbidly frolicsome variety where the characters move around like possessed somnambulists walking slowly but surely to their decided doom. 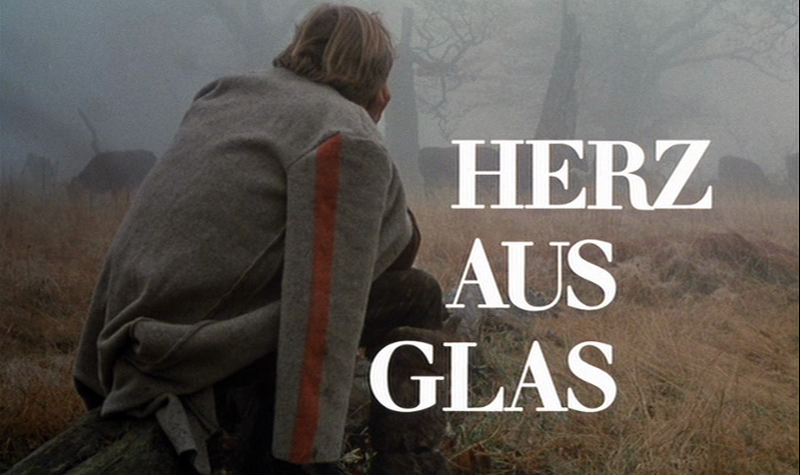 Probably the most flagrantly ‘völkisch’ flick the director ever created, Heart of Glass is essentially Herzog’s outsider answer to the once-trendy anti-Heimatfilm subgenre of German New Cinema as a work that somewhat reluctantly follows in the tradition of Hunting Scenes from Bavaria (1969) directed by Peter Fleischmann, The Niklashausen Journey (1970) co-directed by Rainer Werner Fassbinder and Michael Fengler, The Sudden Wealth of Poor People of Kombach (1971) directed by Volker Schlöndorff, and Bierkampf (1977) aka Beer Chase directed by Herbert Achternbusch. 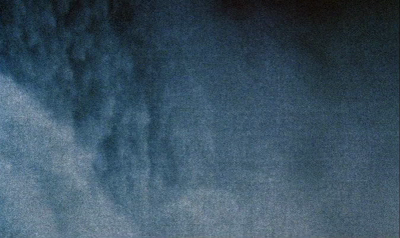 In reference to the film’s title, Herzog stated of Heart of Glass, “It seems to mean for me an extremely sensitive and fragile inner state, with a kind of transparent glacial quality to it,” which certainly describes the peasant characters of the film who, after losing their livelihood (i.e. ruby glass), degenerate into a sinister and savage-like state, killing each other and turning their quaint Bavarian town into mere ruins, thus presenting an assumed allegory of sorts of both World Wars. Set in a late-18th-century Bavarian town, Heart of Glass begins with a perturbing premonition from a Bavarian peasant prophet named Hias (Josef Bierbichler)—a discernibly melancholy yet stoic and half-crazy man who carries the curse of being able to foresee the future—who states towards the beginning of the film, “I look into the distance, to the end of the world. Before the day is over, the end will come. First, time will tumble, and then the earth. The clouds will begin to race…the earth boils over; this is the sign. This is the beginning of the end...” and proceeds to haunt the townspeople with his poetic prophecies. As soon as a fellow named Mühlbeck—the foreman of the town glass factory—suddenly dies without warning, the secret of the ruby glass is lost forever as the glassblowing artisan has ultimately brought the secret behind its creation with him to his grave. Immediately, the townspeople start acting insane, as their ‘hearts of glass’ are easy to shatter, which first reaches its most disturbing breaking point when two friends drinking some brewskis at a Bavarian bar together attack one another, one smashing a glass over the head of another and the other retaliating by pouring beer on his head. 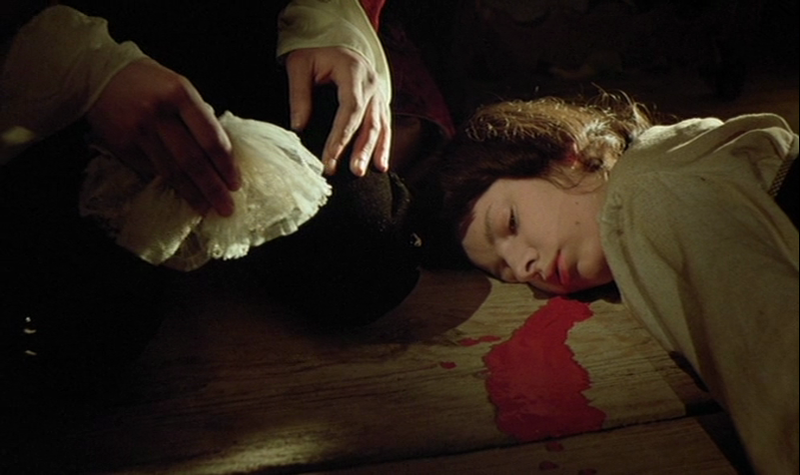 Of course, not long after, one of the men is dead after his comrade smothers him to death. A young broad with a shaved head who resembles and has the quirky mannerisms of a sort of ‘holocaust survivor mime’ has trouble keeping her clothes on as she has a peculiar propensity for standing on tables and stripping while in a sleepwalking state. The town is run by a young Master who is the most profoundly affected by the loss of the Ruby glass secret, declaring in a foreboding fashion “Now what will protect me now from the Evil of the universe?” while in a most melancholy state. The young Master essentially worships the glass, declaring while praying in church, “Glass has a fragile soul. It is unstained. A crack is the sin; after the Sin, there is no sound,” thus the disappearance of the Ruby glassmaking secret is essentially the death of God for the young aristocrat. 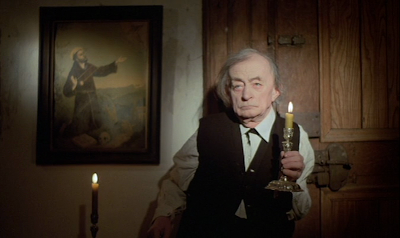 At the Master's side is his eccentric elderly servant Adalbert (played by early Herzog regular Clemens Scheitz, who also appeared in The Enigma of Kaspar Hauser (1974), Stroszek (1977) and Nosferatu the Vampyre (1979)), whose mental deterioration already seemed well underway before the town's mass psychosis. Desperate to find the Ruby glass secret, the Master does a number of insane things in desperation in the hope of finding the formula for the glass, including having plans for foreman Mühlbeck’s house to be demolished and eventually burning down the glass factory, thereupon totally destroying any chance of ever producing the Ruby glass ever again. The young Master even considers having Mühlbeck’s body dug up and his brain examined by Hias. In fact, the Master offers Hias the job of replacing Mühlbeck if he can figure out the formula for the Ruby glass, declaring to the prophet, “I need a glass to contain my blood, or it will trickle away.” Hias attempts to warn the Master’s female servant Ludmilla (Sonja Skiba) to leave the town before the madness swallows her up, but she does not abide his wise words and ultimately pays with her life after the mad Master pierces a dagger into her neck, declaring of her Ruby red blood, “That is the pure ingredient” as if he is a vampire. Declaring, “Hias has wished this calamity on us” and “he has Devil’s eyes, he has the Evil Eye. Lock him up!,” the deranged townspeople imprison the Bavarian prophet not long after the Master burns down the glass factory. While in prison, Hias loses his prophetic prowess as the cell is much too dark and the woods are what speaks to his soul, but luckily the Master comes by and declares to the prophet, “I like you. You have a heart of glass” and the Bavarian prophet is finally able to go on his merry way, where he goes to a cave and wrestles and stabs an imaginary bear, later ‘roasting’ the said imaginary bear in what amounts to a biblical cliche. In his late vision, Hias sees a small rocky island far out in the sea where forgotten men live who, due to their remoteness, do not know that the earth is round and think it is flat, so they decide to “risk the ultimate” and set sail on a small boat to “reach the edge of the world, to see if there is really an abyss,” assumedly sailing to their deaths. 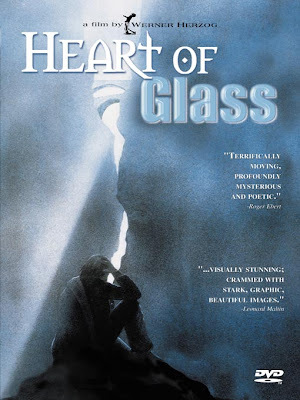 Heart of Glass closes with the quote, “It may have seemed like a sign of hope…that the birds followed them out into the vastness of the sea…,” thus demonstrating the absurdity of superstitious thinking yet its undeniable power in influencing the human will. 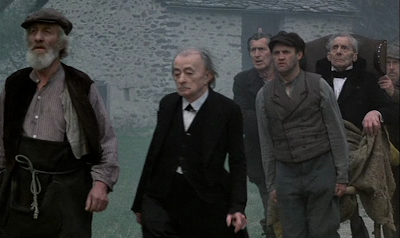 In his work New German Cinema: A History (1989), German film scholar Thomas Elsaesser wrote, “Heart of Glass was Herzog’s attempt to find the strangeness of myth and legend in the heartland of the Heimat film. Based on a story by Achternbusch, it shows (between these two at first sight very similar ‘folklorists’) a radical difference of perception of the genre. Not one of Herzog’s successes, the film might have been better had it been written by its director or directed by its writer. Heart of Glass never seems to be able to resolve whether it is a Heimat film turned inside out, showing the bigotry and rivalries in inbred communities, or whether it celebrates harmony and a oneness-with-nature of the elect. Herzog’s tendency to distance his characters at all costs, even if it means fashioning for them a halo of mystical remoteness (apparently achieved by hypnotizing the cast) runs counter to Achternbusch’s drastic debunking.” Indeed, unlike most anti-Heimat films, Heart of Glass, although critical of the peasantry and its ostensibly 'outmoded' lifestyles and customs, demonstrates a much greater sympathy for its characters, namely Hias (who is somewhat of a stand-in for Herzog), and their way of life as opposed to 'moralistically' depicting Bavarian peasants as a group of rabid redneck racists of the lynch-mob-oriented sort like in Hunting Scenes from Bavaria. Additionally, while Achternbusch tends to portray Bavarian peasants as inbreeding alcoholic morons of the politically and religiously retarded sort in films like Bierkampf (1977) aka Beer Chase and Heilt Hitler! (1986) aka Heal Hitler!, Herzog simply portrays them as simple folk whose entire world can be destroyed after one small part of their daily life disappears, which is a trait that can be said of all of humanity, not just a bunch of hillbilly Aryans from the south. Seeing as Herzog shot the film not far from the area of Bavaria he grew up in, has incessantly stated throughout his career that he has a deep affinity for the Bavarian landscape, and was brought up on the sort of Teutonic mystical folk stories told in the film, Heart of Glass is ultimately more of a modern apolitical Heimatfilm as opposed to a leftist lynch mob anti-Heimatfilm, thereupon making it a strikingly singular work in the subgenre that breaks with convention. Another attempt by Herzog to find the “ecstatic truth,” Heart of Glass is a ‘hypnotic’ tragicomedic work of the Germanic quasi-mystical persuasion featuring Caspar David Friedrich-esque like romantic imagery that, while it may not be the director’s greatest film by any means, surely makes for one of his most impenetrable, on top of being one of the most mystifying and aesthetically alluring ‘heimat’ films of the post-WWII era. 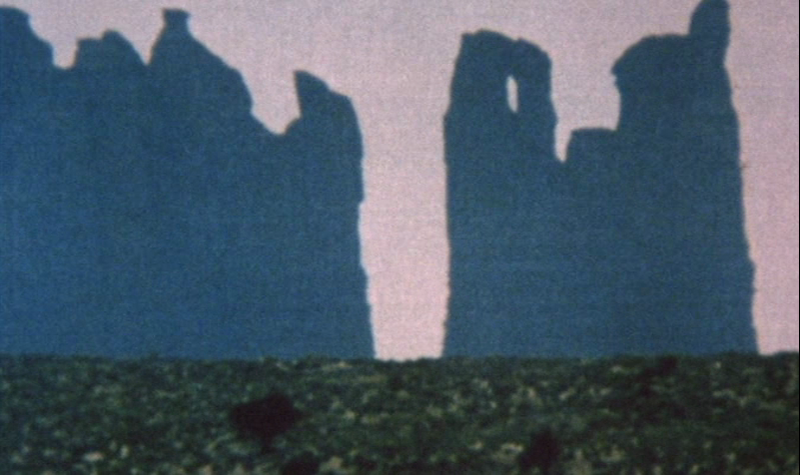 Intentionally using a musical score by his longtime krautrock collaborator Popol Vuh in the hope of further achieving his objective of hypnotizing his viewer, Werner Herzog may have been attempting a cheap gimmick via Heart of Glass, but regardless, the celestial celluloid work still has a titan Teutonic cinematic heart that is quite indicative of what separates the Bavarian auteur not only from his countryman and collaborator Herbert Achternbusch, but also every other filmmaker in cinema history.